As a compromise with internationalist critics, the Big Four nations became the permanent members of the United Nations Security Council, with significantly less power than envisioned in the Four Policemen proposal. When the United Nations was officially established in later 1945, France was in due course added as the fifth member of the council at that time due to the insistence of Churchill. The State Department had begun drafting a postwar successor to the League of Nations under the auspices of Roosevelt while the United States was still formally a neutral power. Roosevelt was reluctant to publicly announce his plans for creating a postwar international body. He was aware of the risk that the American people might reject his proposals, and he did not want to repeat Woodrow Wilson's struggle to convince the Senate to approve American membership in the League of Nations. When the Atlantic Charter was issued in August 1941, Roosevelt had ensured that the charter omitted mentioning any American commitment towards the establishment of a new international body after the war. The attack on Pearl Harbor in December 1941 led to a change in Roosevelt's position. He transformed his trusteeship proposal into an organization centered around the Four Policemen: the United States, China, the Soviet Union, and Britain. China was brought in as a member of the Big Four and a future member of the Four Policemen. Roosevelt was in favor of recognizing China as a great power because he was certain that the Chinese would side with the Americans against the Soviets. He said to British Foreign Secretary Anthony Eden, "In any serious conflict of policy with Russia, [China] would undoubtedly line up on our side." The President believed that a pro-American China would be useful for the United States should the Americans, Soviets, and Chinese agree to jointly occupy Japan and Korea after the war. When Molotov voiced concerns about the stability of China, Roosevelt responded by saying that the combined "population of our nations and friends was well over a billion people." 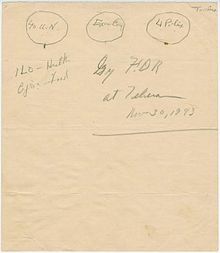 On New Year's Day 1942, the representatives of Allied "Big Four", the United States, the United Kingdom, the Soviet Union and China, signed a short document which later came to be known as the Declaration by United Nations and the next day the representatives of twenty-two other nations added their signatures. A new plan for the United Nations was drafted by the State Department in April 1944. It kept the emphasis on great power solidarity that was central to Roosevelt's Four Policemen proposal for the United Nations. The members of the Big Four would serve as permanent members of the United Nation's Security Council. Each of the four permanent members would be given a United Nations Security Council veto power, which would override any UN resolution that went against the interests of one of the Big Four. However, the State Department had compromised with the liberal internationalists. Membership eligibility was widened to include all nation states fighting against the Axis powers instead of a select few. 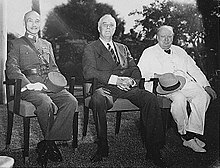 The Dumbarton Oaks Conference convened in August 1944 to discuss plans for the postwar United Nations with delegations from the United States, United Kingdom, Soviet Union, and China. The Big Four were the only four sponsoring countries of the San Francisco Conference of 1945 and their heads of the delegations took turns as chairman of the plenary meetings. During this conference, the Big Four and their allies signed the United Nations Charter. ^ a b c Gaddis 1972, p. 27. ^ 1946-47 Part 1: The United Nations. Section 1: Origin and Evolution.Chapter E: The Dumbarton Oaks Conversations. The Yearbook of the United Nations. United Nations. p. 6. Retrieved 18 February 2018. ^ United Nations Official Website. ^ Ma 2003, pp. 203–204. ^ United Nations Official Website 1945. ^ Gaddis 1972, p. 28. Ma, Xiaohua (2003). The Sino-American alliance during World War II and the lifting of the Chinese exclusion acts. New York: Routledge. pp. 203–204. ISBN 0-415-94028-1. United Nations Official Website. "1942: Declaration of The United Nations". United Nations. Retrieved 21 April 2016. United Nations Official Website (1945). "1945: The San Francisco Conference". United Nations. Retrieved 16 May 2015.